Diane Setterfield has already written one of the most intriguing, haunting novels of our times. The Thirteenth Tale is the beautifully strange love-child of Wuthering Heights and Jane Eyre, its Gothic atmosphere and the dialogue faithful to the vision of an extremely gifted writer. Once Upon A River is even better. No, it is infinitely better and you know how much I loved The Thirteenth Tale. In fact, it is already a member of The Best Books of 2019 squad. I would be negligent if I didn’t mention what I felt to be the most important theme in this beautiful book. Parenthood. The unimaginable pain of losing your child, the false hopes, the fear and suffering that are ever-present during the birth of a child, the need for an offspring that exists in most people. Setterfield creates a marriage between everyday themes, haunting settings, and a peculiar, eerie story and the writing reaches perfection. What does it mean ‘’slow book’’ or ‘’fast book’’? Most of the times, characterizations such as these mean nothing. We have ‘’good’’ books and ‘’bad’’ books. Quality book and books- junk that I wouldn’t gift to my enemy. 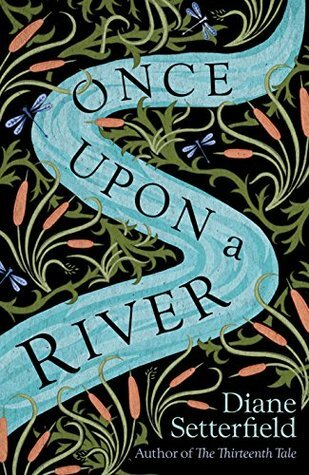 Once Upon A River is one-of-a-kind. The dialogue is outstanding, exceptional. So faithful it is that you will immediately feel transported to the 19th century, mingling with nobility and ordinary people who love to sit in a dimly lit inn. Rita and Henry Daunt are marvelous (…and I might have fallen in love with Mr. Daunt a little too much…) Margot, Mr. Armstrong, so many interesting characters that will keep you a fine company. So very happy you loved this mesmerizing story. It was truly perfect! Thank you, Marialyce! It is truly a unique novel. Thank you so much, Callum! !